A win like this was desperately needed, and the Rangers did not disappoint. Right before heading out on a three game road trip, the Rangers (18-7-3) got a bit of a confidence boost when they defeated the Ottawa Senators (14-8-5) by a final score of 4-1, playing one of their strongest games of the season. The Rangers defensive effort was very strong, limiting Ottawa to just 24 shots on goal, and just three in the third period. They managed to throw 31 shots on goal themselves, and controlled the flow of the game from the get-go. After some lackluster performances lately, the first period was very strong from the Rangers. They finished with 10 shots on goal, some great scoring chances, and more importantly, two goals, both of them coming on the power play. The first power play opportunity came at 7:16 of the first period when Mika Zibanejad took out Dan Boyle away from the puck. New York was cycling the puck well, and Chris Kreider took the puck behind the net. He passed it up to Keith Yandle, who faked a shot before sending it over to Ryan McDonagh for a one timer. Kreider had moved perfectly in front of Anderson, and the Ottawa goalie did not see the puck fly past him and into the net. It was McDonagh’s fourth goal of the season. Shortly after that, Senators coach Dave Cameron was assessed and unsportsmanlike minor for arguing with the officials, handing the Rangers their second power play opportunity. Cameron was upset that there was no call on Tanner Glass for a hit from behind on Marc Methot. New York wasted no time as Derick Brassard found the back of the net, and New York remained red hot on the man advantage. Rick Nash passed the puck to McDonagh at the point, and he waited until he spotted an open shooting lane with Brassard and Dan Boyle jostling for position in front of the net. 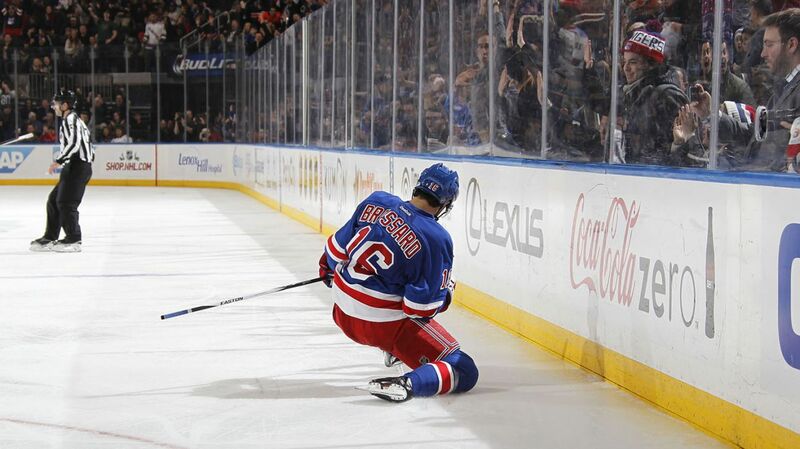 McDonagh’s shot was masterfully tipped in past Anderson by Brassard, his eighth goal of the season. The Rangers limited Ottawa to just one shot on goal through the first 10 minutes of the game, but they had some chances later on. Henrik Lundqvist made two consecutive saves in the dying minutes of the period after Karlsson centered a puck, and Zibanejad and Zack Smith each had a whack at it. 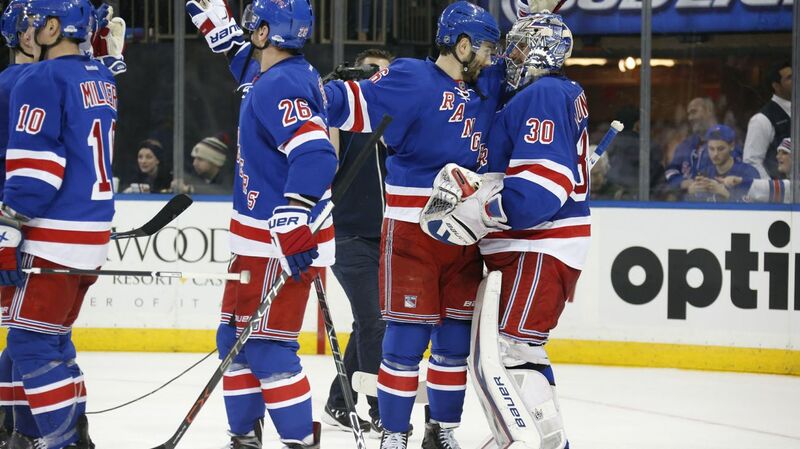 But Lundqvist turned them away and brought a 2-0 lead into the locker room. The ice was tilted in Ottawa’s favor a bit more that period, as they began playing more aggressively. The Senators would outshoot the Rangers 13-9 in that period, testing Lundqvist more frequently. The Senators scored their first goal of the game just over six minutes into the period right off of the faceoff. Shane Prince and Dave Dziurzynski won the puck back to Marc Methot, and he quickly fired a shot on net. The puck deflected off of Marc Staal’s stick and past Lundqvist, cutting the lead to just one. The Rangers had a few chances after that, mainly coming from the speed of Rick Nash and Chris Kreider down the wings. Dylan McIlrath used his rocket shot from the point, just missing the net on a few occasions. It wouldn’t be a Rangers game without some remarkable saves from Henrik Lundqvist, and he delivered again. The Senators pressed late in the period again, and Lundqvist made three saves in a matter of a minute at the end of the period; stopping Stone’s shot with a blocker, kicking out the right pad on a shot from the point, and making this remarkable glove save on Dziurynski. The third period may have been one of the best that the Rangers have had all season long. When heading into the third with a lead, the Blueshirts tend to be good. But today, they were exceptional. Alain Vigneault made sure his squad never took their foot off of the gas, outshooting the Senators 12-3 and keeping them from doing much of anything at all. In fact, the Senators didn’t have a shot on goal in the last six minutes while they were trying to pressure. The Rangers stood tall in the neutral zone, making plays there and clearing the puck down the ice. Halfway through the period, Derick Brassard found the back of the net again, blasting a slap shot past Anderson on the breakaway and scoring a crucial third goal. Brass won the faceoff and anticipated a stretch pass, which came from Ryan McDonagh. The captain bounced it over the sticks of some Ottawa defenders and Brass went on to score his second goal of the game, and his ninth goal of the season. With Craig Anderson on the bench, Jesper Fast sealed the win with an unassisted goal from center ice, snapping a 12 game goalless drought and sending the Rangers on their road trip happy. This really was the best performance from the team in a month or so. They generated some really good scoring chances, outshot and outchanced the Senators, scored on the power play, and controlled the neutral zone. Just about everything went right. Derick Brassard has done very well since Stepan was injured. Brass is second on the team in scoring with 20 points (9-11-20), and has anchored the middle of the lineup. He’s been one of the most consistent players on the team, and was important tonight. Ryan McDonagh had an excellent night, tying a career high with three points (1-2-3). He had two points on the power play, and also played a strong defensive game. The captain has 13 points (4-9-13) this season. Dylan McIlrath is getting better. He rarely ever makes mistakes, he’s surprisingly good out outlet passes, very good at puck battles, and he has one of the hardest shots on the team. If the team can work on having him shoot on target, he’ll be a weapon from the point. Lundqvist didn’t have a very heavy workload, but he played extremely well. Hank picked up his 14th win and now has a 1.99 GAA and a .938 save percentage. This is the Rangers team we know and love. This is how they are capable of playing every night. Vigneault will take on his former team Wednesday in Vancouver to kick off a three game road trip. Posted on December 7, 2015, in Game Recaps and tagged Alain Vigneault, Antti Raanta, Chris Kreider, Craig Anderson, Dan Boyle, Dan Girardi, Derick Brassard, Derick Stepan, Dominic Moore, Dylan McIlrath, Emerson Etem, Erik Karlsson, Henrik Lundqvist, Jarret Stoll, Jesper Fast, JT Miller, Keith Yandle, Kevin Hayes, Kevin Klein, Madison Square Garden, Marc Staal, Mats Zuccarello, Mike Hoffman, MSG, New York Rangers, New York Rangers blog, NYR, Oscar Lindberg, Ottawa Senators, Rangers, Rangers blog, Rick Nash, Ryan McDonagh, Stepan injury, Viktor Stalberg. Bookmark the permalink. Leave a comment.